Are These Recessions All the Same? Here are some data on job losses in each recession since 1970 (I grouped together the two recessions in 1980-1982). I look at total losses in nonfarm payroll employment and losses in employment in the durable goods sector. The figures are in thousands. I used the NBER business cycle dates. Durable goods would include construction materials and household durables, such as refrigerators, so this sector bears the brunt of housing fluctuations. Employment in residential construction by itself is too small to be a dominant factor. Indeed, in the 2007-2009 recession, only 263 thousand jobs were lost in residential construction (almost that many had already been lost between the peak of the housing boom and the start of the overall recession). Note that in the first three recessions, the durable goods sector accounts for essentially all of the total job losses. In the most recent recessions, it accounts for considerably less. Note, also, that the most recent recessions are the ones during which productivity (as measured) did relatively well and which were followed by jobless recoveries. So, the essay question, students, is this: has the economy changed in the most recent recessions and, if so, how? My answer would be that the first three recessions in the table are your father’s recessions, in which excess inventories lead firms to lay off workers, many of whom will be recalled once sales and inventories are back in balance. The PSST interpretation would be that production reached unsustainable levels at the end of the booms, but a lot of the excess could be worked off using temporary layoffs. The AD-AS story would be that durable goods is the cyclical sector that is affected by AD. In the most recent recessions, a lot more of what is going on is permanent restructuring. The PSST interpretation would be that many industries took this as an occasion to cut costs and to let technological advances show up as higher productivity. Actually, I do not think that the AS-AD people want to admit that there is any difference between the two sets of recessions. The size of the multiplier can be inferred from the Korean War experience or whatever, because everything else holds constant. Nothing to see here. Move along. A guess: Consumption depends (mostly) on permanent income. If you think the recession is going to be short, C doesn’t fall much. People and firms just postpone buying durables. 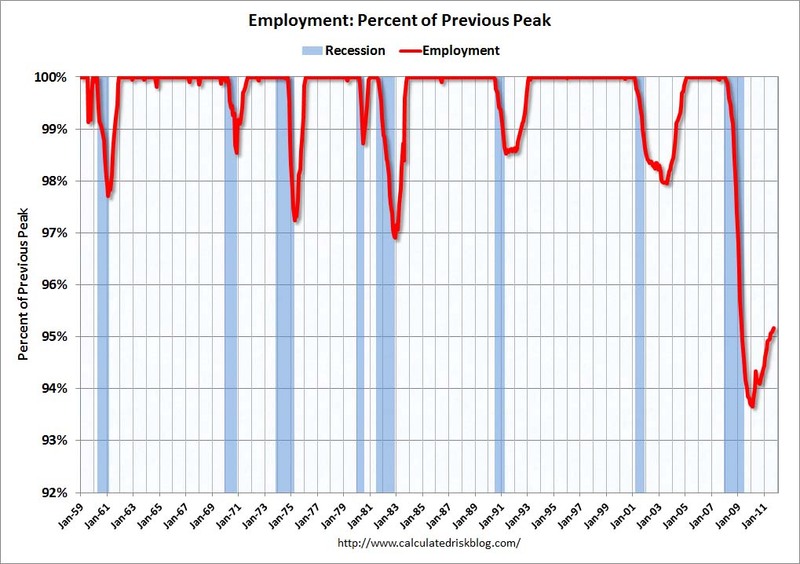 If you think the recession is going to be long, C falls much more. People thought this recession would be longer, with a slower recovery. Thought-provoking post. I see you recognizing the AD argument that employment losses have occurred across many industries. Do you agree that this recession has both AD and PSST components, or do you have some other explanation in which PSST explains everything? I can see a clear line from Hayek through to PSST, but I’m a bit of an outlier–as I’ve discussed over in one of Nick’s threads–in terms of what I’d label as ‘Austrian’ business cycle theory. IMO, the profound insight that you get from 1800s Austrian Capital theory is that certain industries are interest-rate sensitive and certain industries are interest-rate insensitive. Indeed this was Mises’s summary himself in the ToMC: the great austrian contribution was to explain why the durable goods industry was more cyclic. Indeed in ToMC you can find all of the statements of fact necessary to derive the AD/AS theory. Keynesians like to think they own the paradox of thrift, but the paradox of thrift is not primarily about an excess demand for money (that was already well known and understood), it was about how the market processes were not self-correcting. i.e., that there was a bad equilibrium. So, I think you have a good point here. Proponents of the AD/AS explanation like to claim that a recession in all markets is what their theory explains, but that isn’t right. The money component of the AD/AS story interacts via the interest-rate channel to recess certain industries first. If the curent malaise was the only exception, I might ask whether when the zero bound is breached if recessing the cyclic goods industry is adequate–i.e., the effects spill over. Clearly though in 90-91 and 2001 we weren’t at the lower bound. Moreover 90-91 was very mild and 2001 was sort of mild. So, I don’t think I’ve made a useful distinction. Regarding Nick’s theory, I raise the same concern: expectations of a bad recession make sense today, but can that explain 90-91 or 2001? has the economy changed in the most recent recessions and, if so, how? Yes, but not only in recessions, more importantly in growth phases as well. Inventory control is far better now due to ERP/JIT, faster delivery and possibly shorter product life cycles. This means fewer inventory recessions reflected in the decreasing frequency of recessions. CAD/CAM and robotics have also tremendously increased productivity in manufacturing with little need for incremental jobs. We are also undergoing a restructuring of retail sales from physical to virtual sales locations. This chart and this chart show that it is taking longer and longer to recover the jobs lost as frequency of recessions increases. And today’s unemployment number shows that the way we are going to get the unemployment rate down is by reducing participation in the labor force, not creating jobs. More and more ZMP workers will choose to leave the labor force, perhaps to “early retirement” as it becomes uneconomic and difficult for aging boomers to acquire new skills for the new economy as well. In addition, entrepreneurs do not fully understanding the emerging new economy and who to hire for what. What this makes me wonder is which portion of political economy is currently more important, the political or the economic? Should the focal statistic for political economy should be output or jobs? Interesting times. Arnold, this is one of your top ten posts. A very compelling nugget. Also, If you simplify/explain the economics (AS-AD, PSST) lingo, this would be a good Wall Street Journal Op Ed or similar popular piece. I would also mention the reverse economic effect – expansion when there was a withdrawal of demand and withdrawal of money (e.g. the end of world war II). David Henderson had one of the best blogs ever on EconBlog going over this: U.S. government spending drop equal to 25-33% of the economy over two years, yet an economic expansion occured over five year period (or something like that). Hasn’t Krugman made comparisons of pre- and post-1990 recessions acknowledging that the nature of the US economy and employment post-1990 has changed? Isn’t Krugman an AS-AD guy? Hasn’t Krugman argued that the deepest insights and therefore basis of the best prescriptions for the most recent recession and weak recovery come from comparisons to the 1930’s recession and its aftermath, i.e. “the great depression”. Is it possible that PSST insights are more effective for treating 90-91 or 2001 type recessions in the future but much less so the current environment? So we have two tenured professors employed by some of the crappiest universities in their respective countries patting themselves on the back. Good grief. Use percentage (change or level) job losses, Kling. Rowe is clueless about consumption. Try real retail sales, not some hedonically adjusted imputed crap. It isn’t that there isn’t any difference between recessions but that the solution, in so far as there is one, is the same. Recessions that are created by higher interest rates can be cured by reducing them and operates directly on interest sensitive sectors. Recessions that aren’t created by higher interest rates must be cured by lowering costs and increasing profitability of all sectors. Reducing interest rates is still necessary but less effective both because other sectors are less sensitive and the lower bound. Directly supplying cash to everyone would be much more effective in these circumstances but is not politically possible. It seems obvious to me that the recent recessions are very different from previous ones. Not because of your data, however. 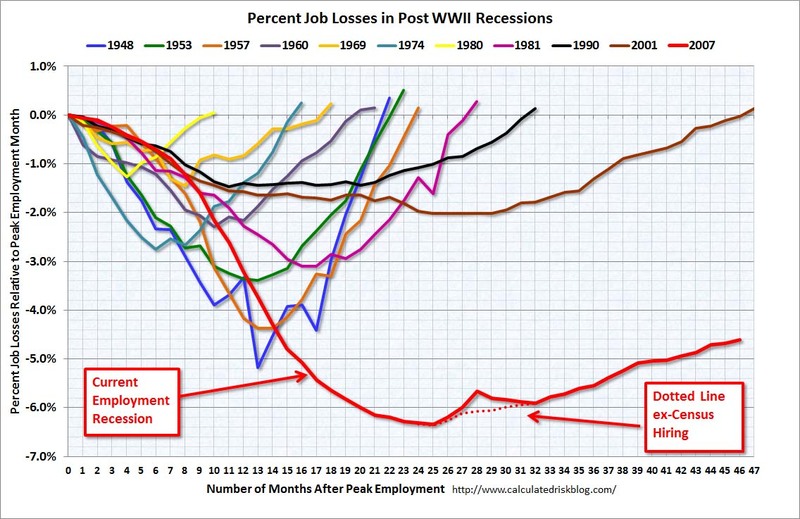 Instead, look at the drop in jobs vs. time, which is well shown by The Scariest Jobs Chart Ever. it is taking longer and longer to recover the jobs lost as frequency of recessions increases. Could be possible that today more people works in the non-durable goods sector? If that is the case, could be one of the reason because less jobs (compared to the total job losses) have been lost in durable goods sector in the last recessions. I had to think for a minute about the way the data was set up, but once I realized what it represented, those numbers are extremely useful and telling. A pattern of production seems somewhat stable in what is both needed and being made available. It’s the inclusion of services in the total numbers that will continue to be volatile and dependent on the durable goods production itself. Interesting in that the totals numbers reached a temporary height (1980-82) in the mass consolidation of middle management. If you haven’t gone to “calculated risk” and found the charts gallery and studied it, do so now. Right now. In the real world PSST and AD and AS all interact. What is cause, what is effect, what is feedback loop will be hard to sort out. Maker of valve gates for high end vacuum equipment. Had 85 people. Hit by recession. Down to 45 people. Discovers that the machinery it *already owns* can run “lights out” so one shift of people can create 3 shifts of output. Now makes *more* physical output, with apparently about 50 (versus prerecession 85) people. Said output is likely of higher quality because that is what demand is for. Prices likely flat. So *more real wealth*, some more GDP but the raw dollars won’t reflect all the increase in wealth, and rather fewer people. It’s not ZMP people, it’s ZMP jobs. More real wealth, somewhat less more GDP, fewer people. Forever. I’m an AS/ADer, and I point out that the share of the workforce that is involved in building durable goods has plummeted in the past 50 years. So I’m not surprised they make up a much smaller share of job losses.